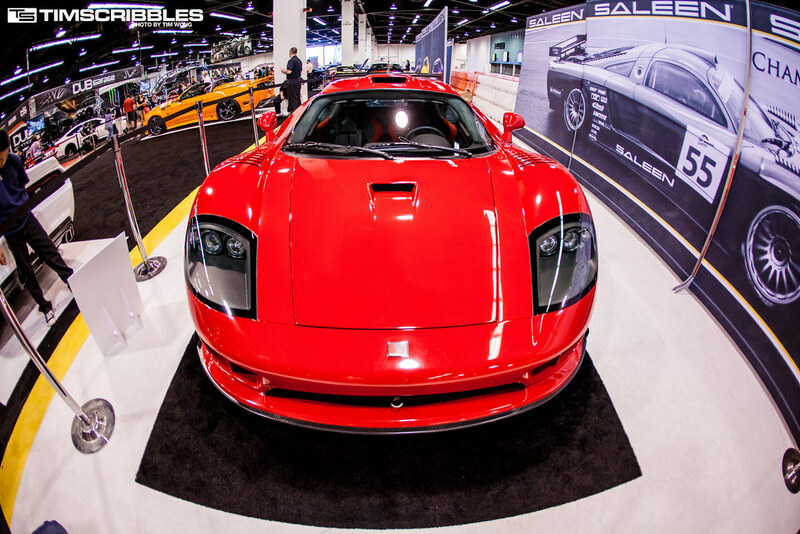 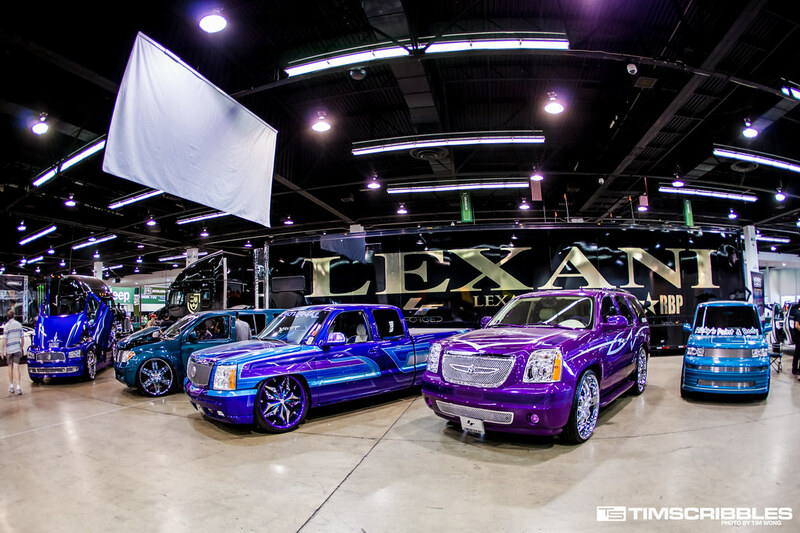 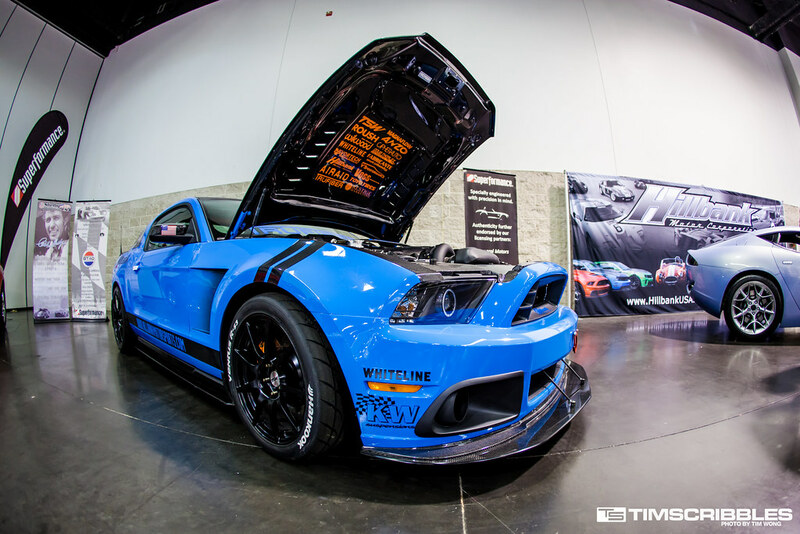 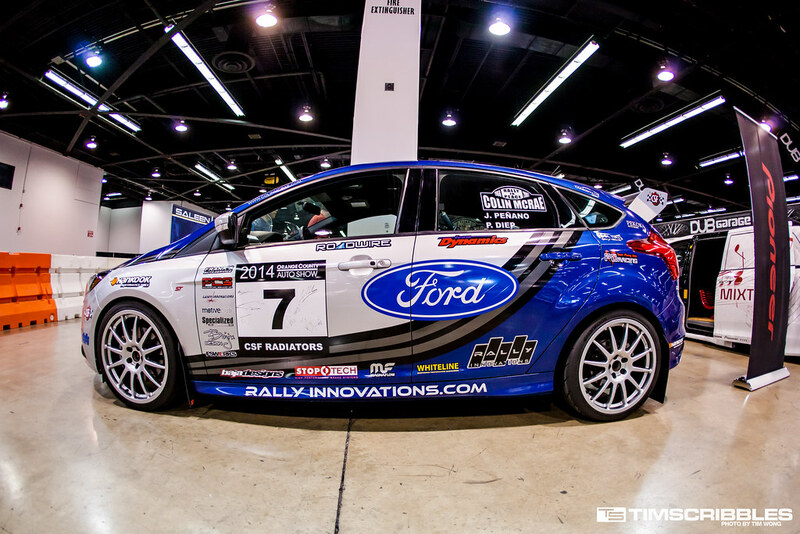 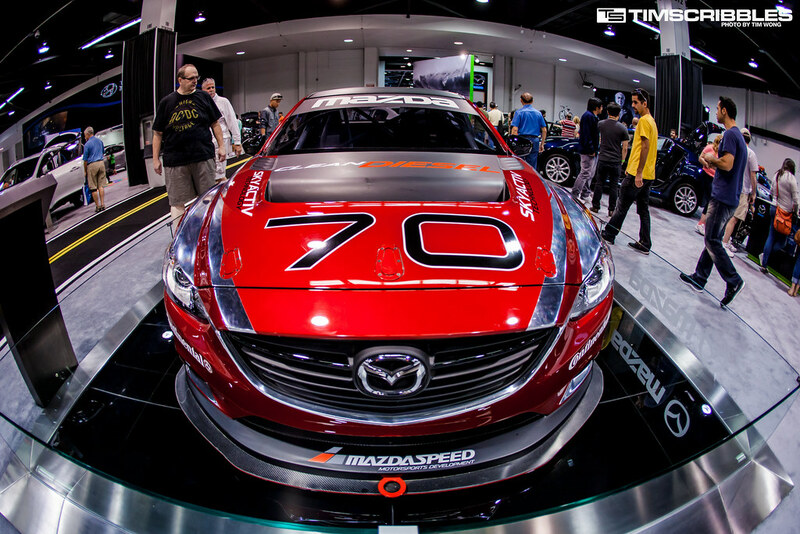 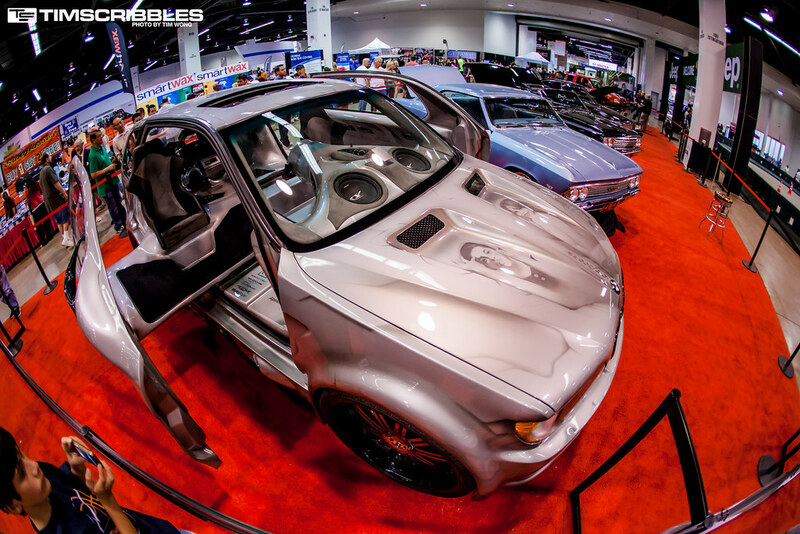 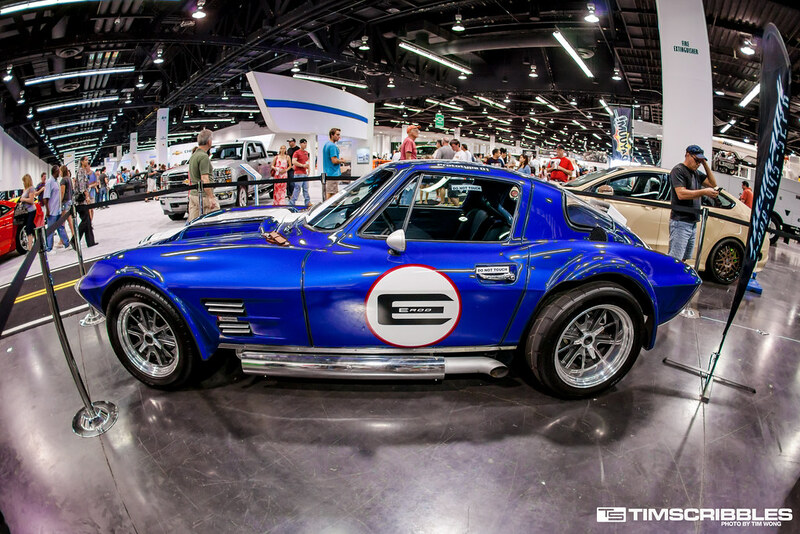 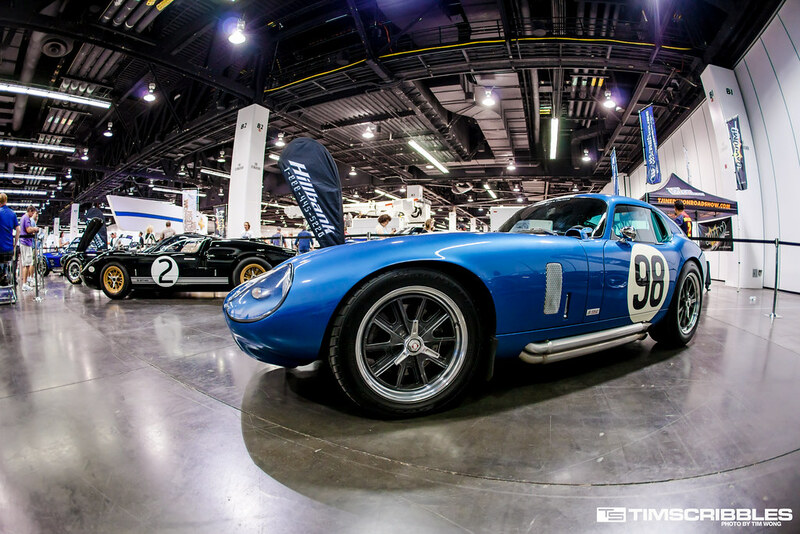 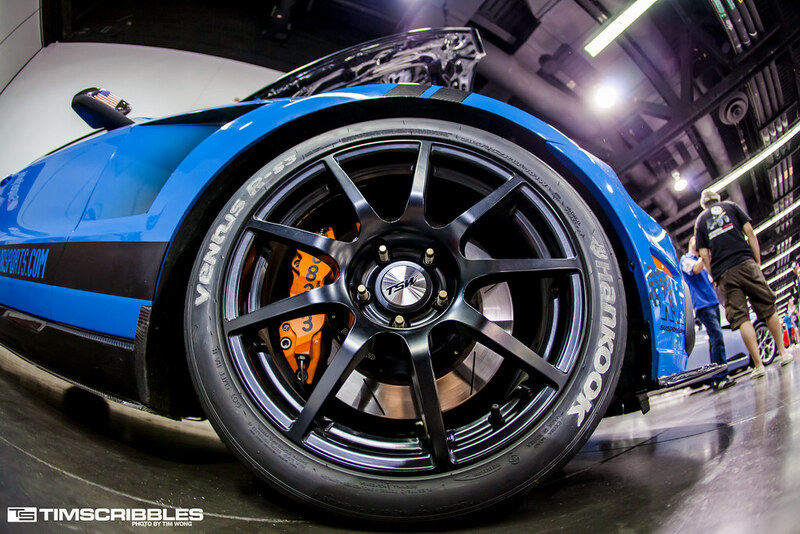 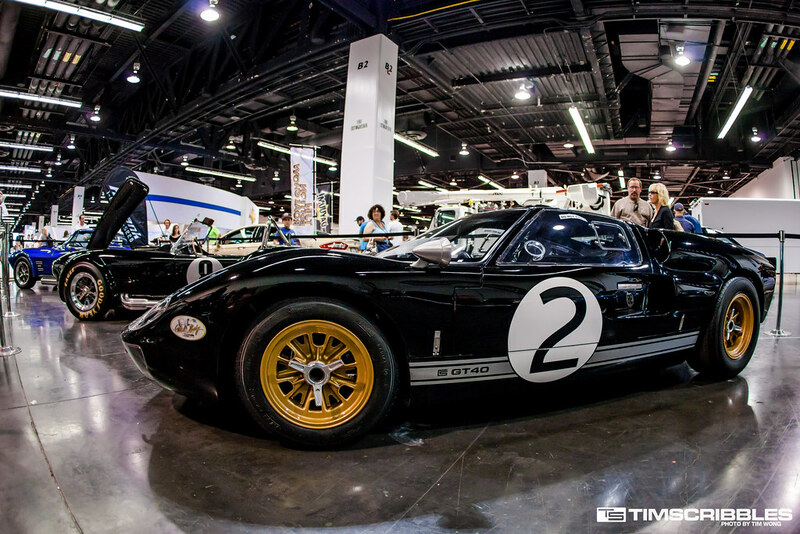 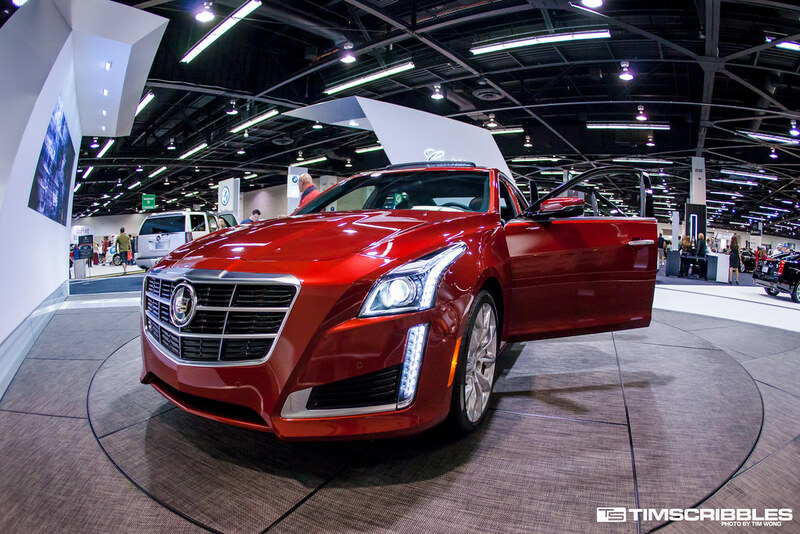 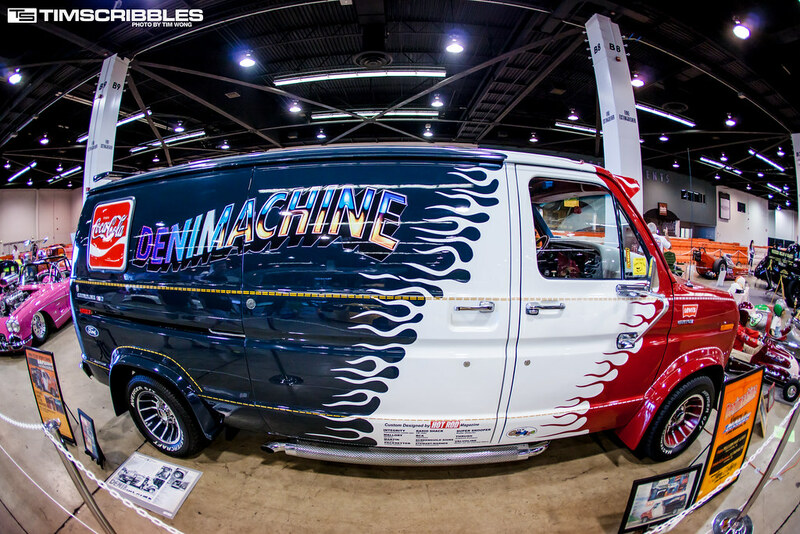 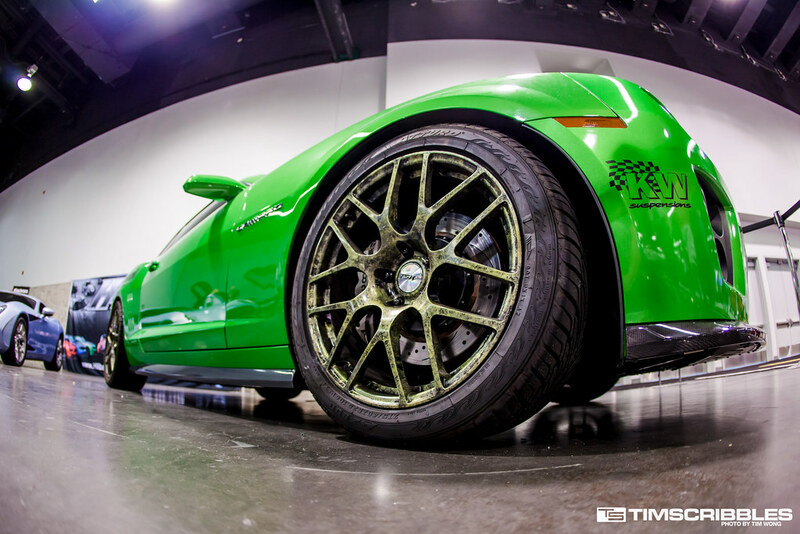 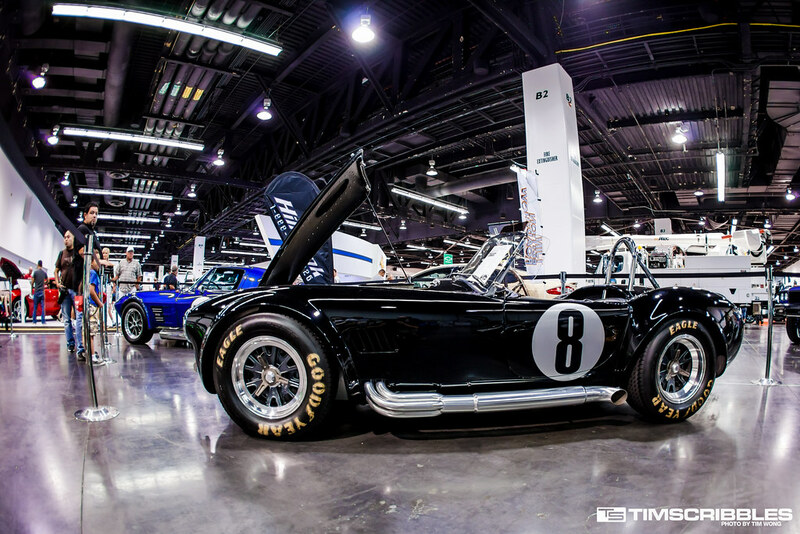 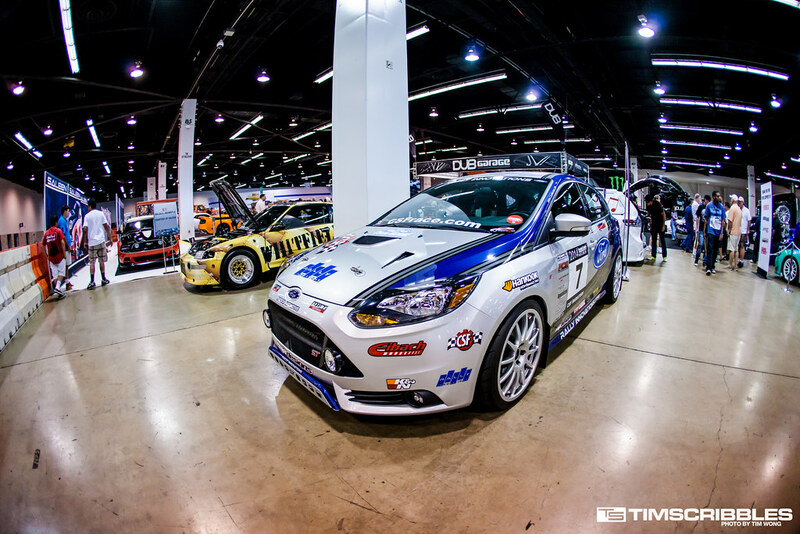 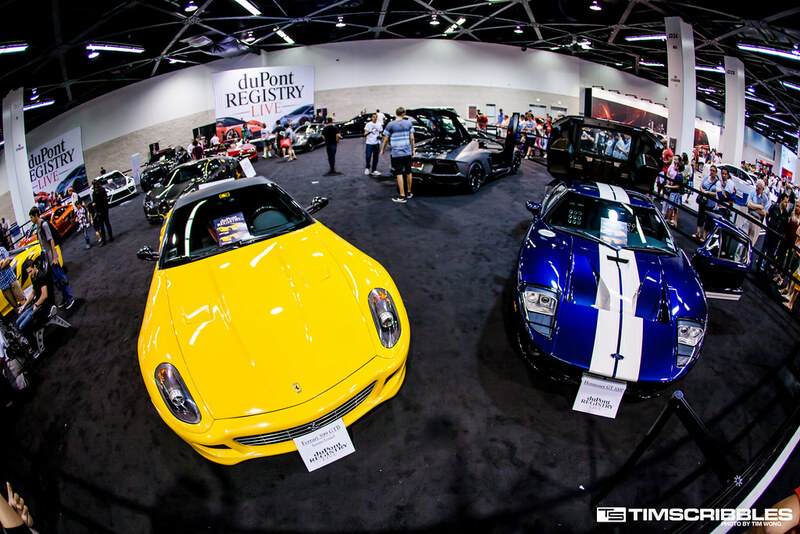 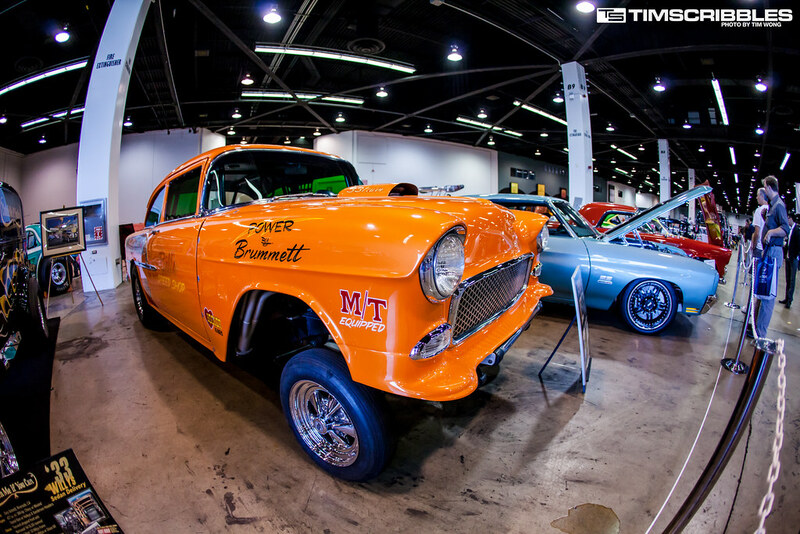 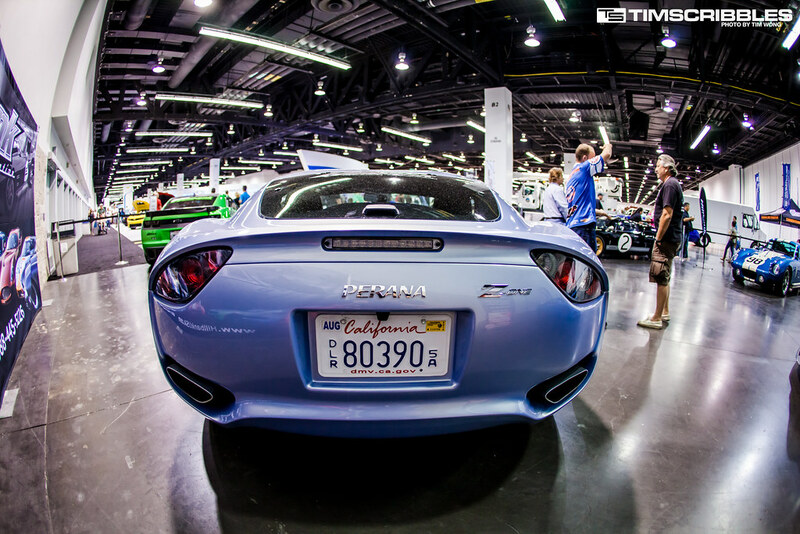 Over the weekend, the annual Orange County Auto was taking place at the Anaheim Convention Center featuring the many manufacturer vehicles as well as a good range of aftermarket vehicles. 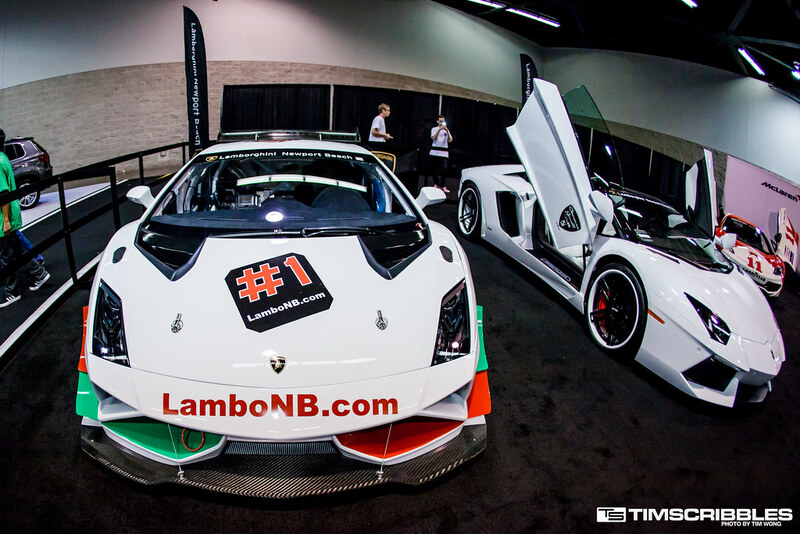 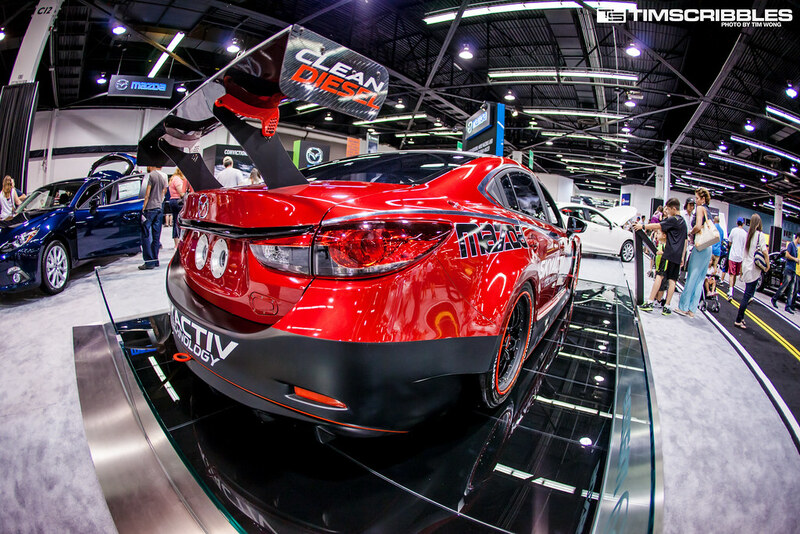 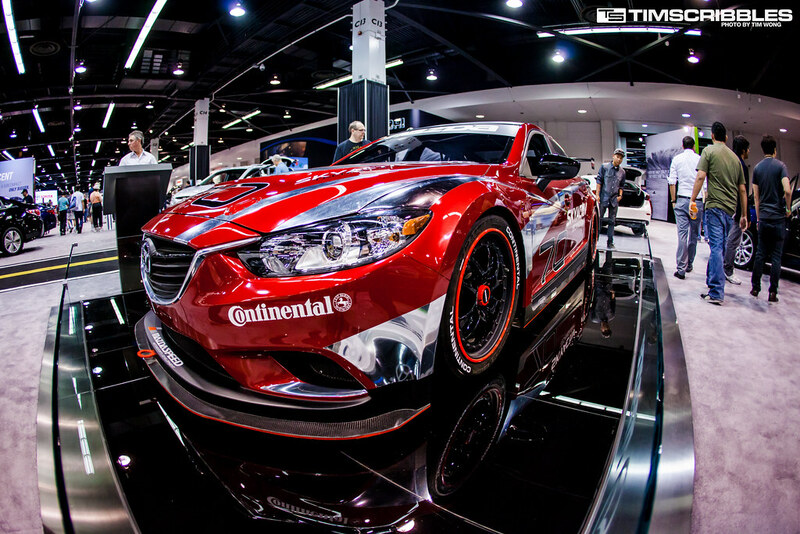 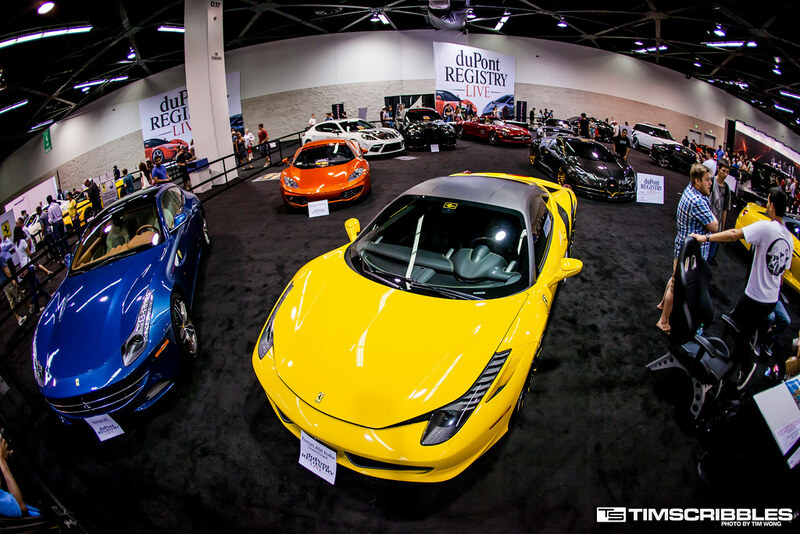 The OC Auto Show has been steadily getting bigger year after year, but no where near as large as the LA Auto Show. 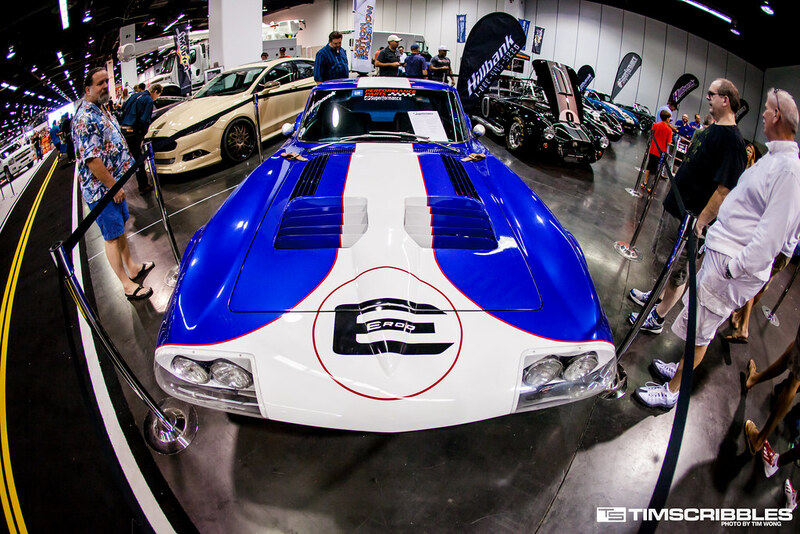 The nice thing about this show is the aftermarket vendors change every year and present some fresh new cars. 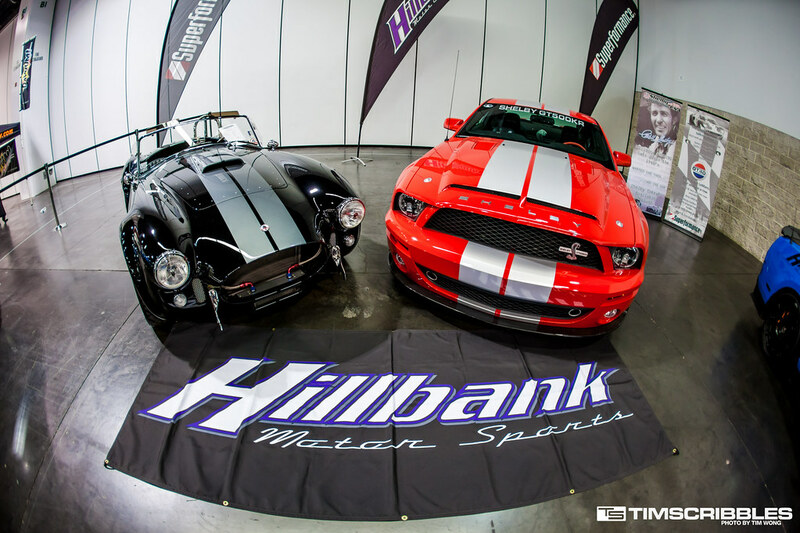 The first booth I stopped by was the Hillbank Motorsports booth which had several nice American vehicles on display vary from classics to current generations. 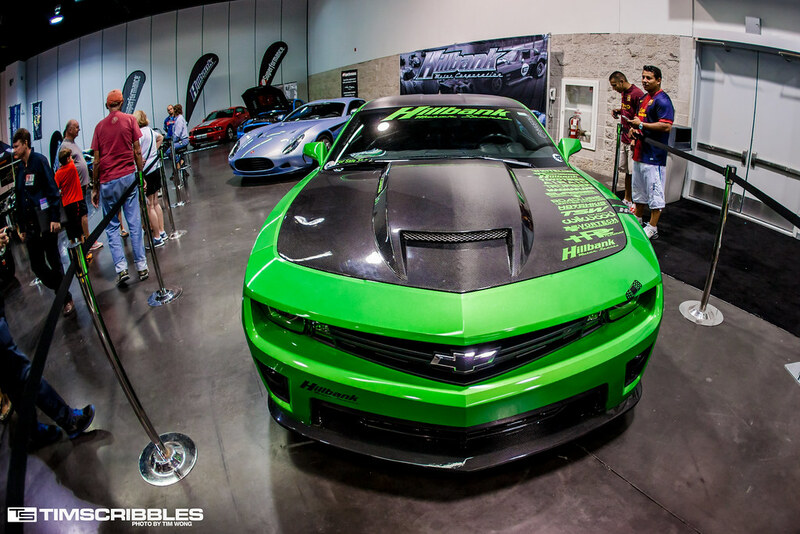 This green Camaro had some interesting wheels that were dipped in some texture design. 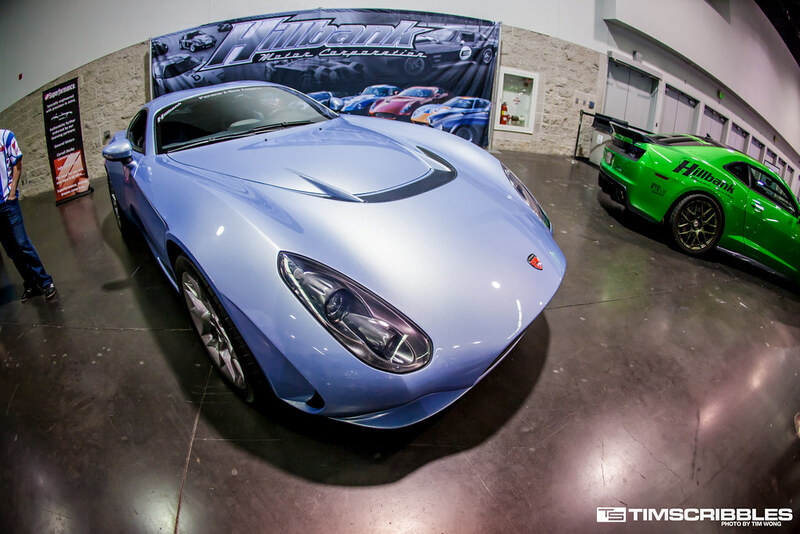 Next to the Camaro was a rare Perana Z-One which I’ve seen only a couple occasions at Cars and Coffee Irvine. 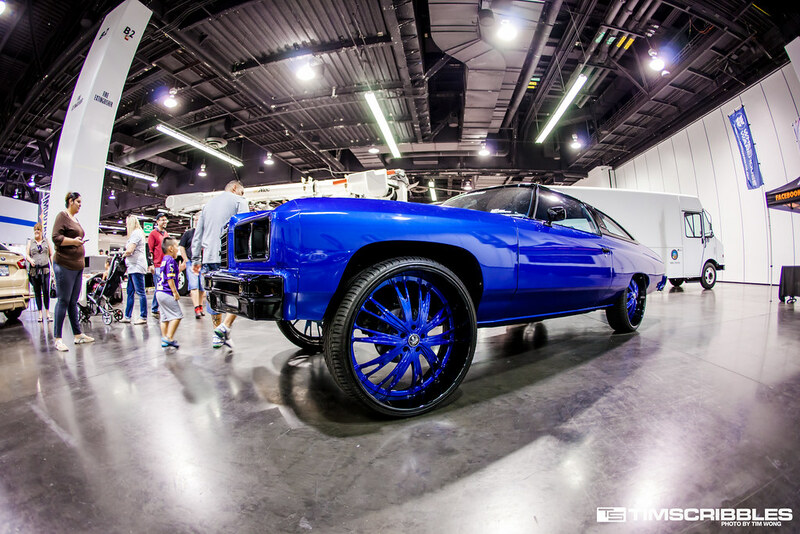 The only “donk” car at the show caught some attention as it stood out amongst the rest of the cars in that area. 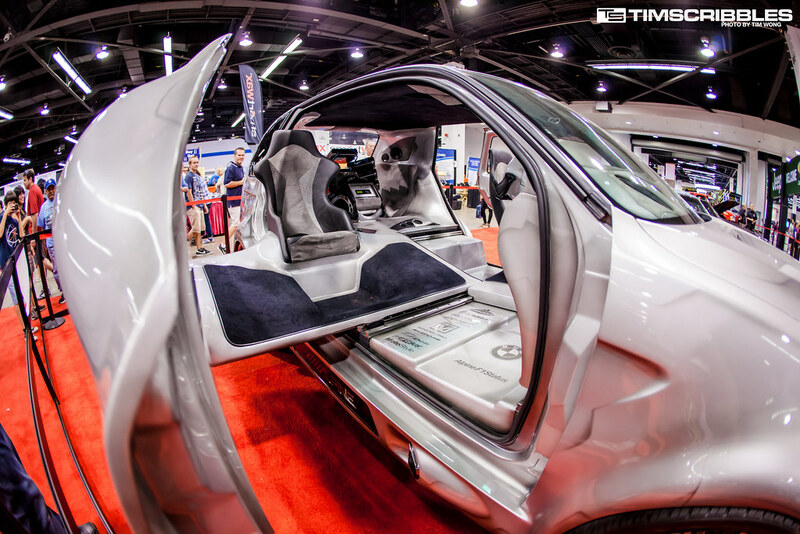 In comparison, this, which may have started out as a BMW SUV, takes the cake in terms of extravagance with the paintwork, the extensive audio system, and the extremely elaborate door mechanisms. 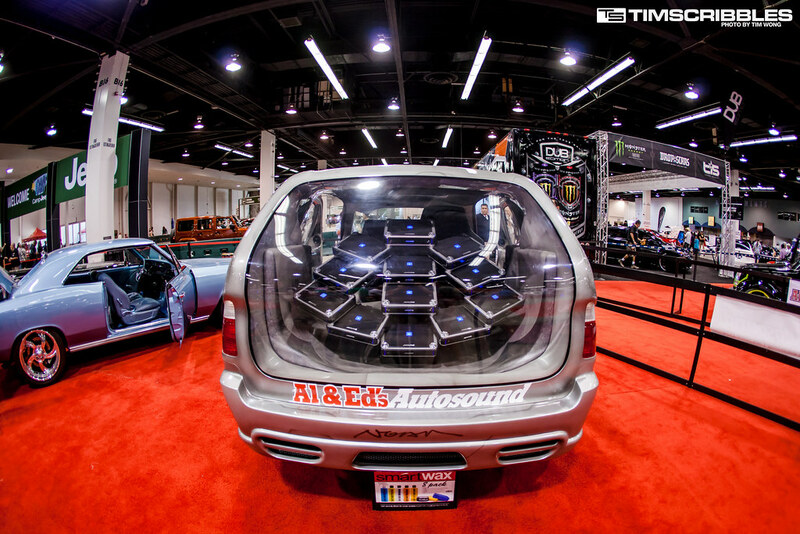 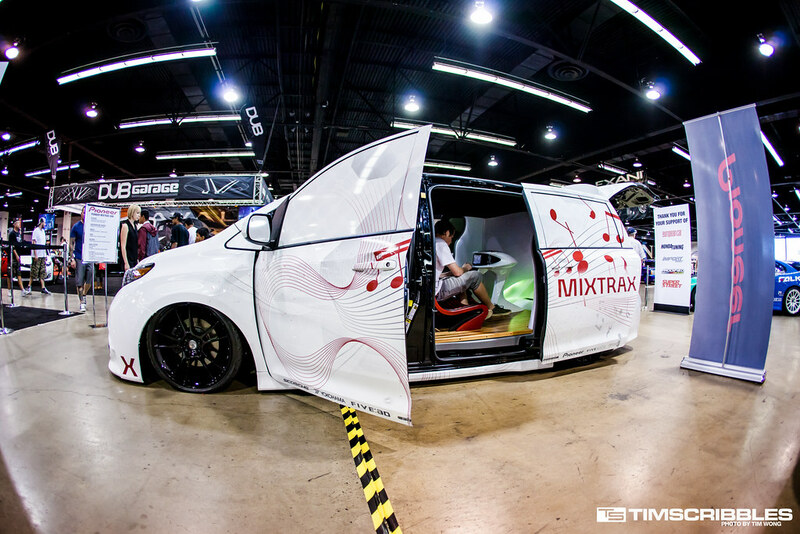 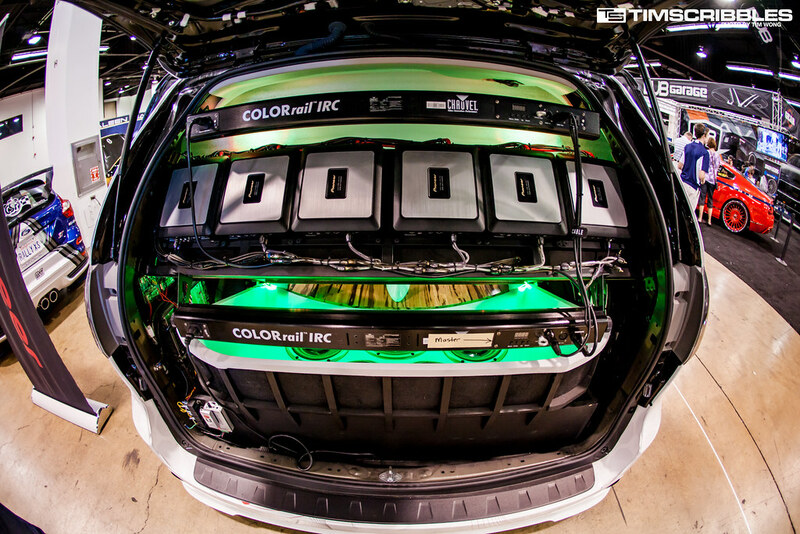 This Toyota Sienna has been bagged and converted into some type of audio/video lounge. 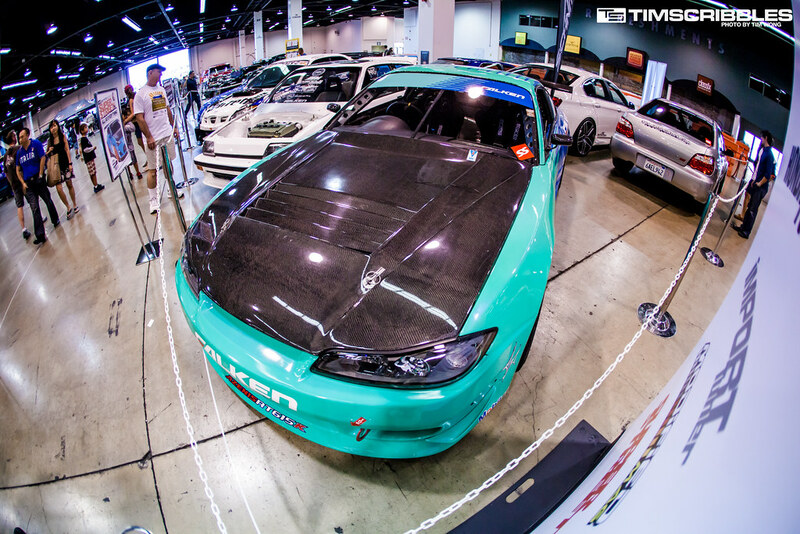 The aftermarket section area had some nice cars, but the way they laid out the cars was beyond terrible. 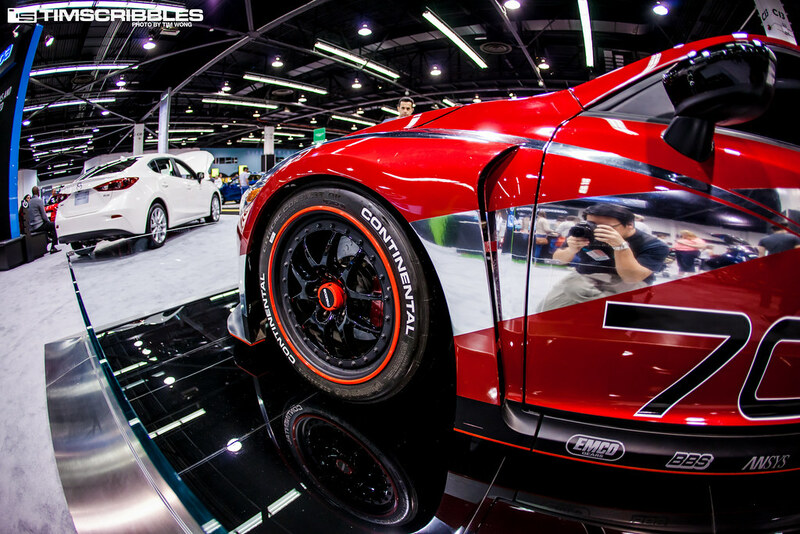 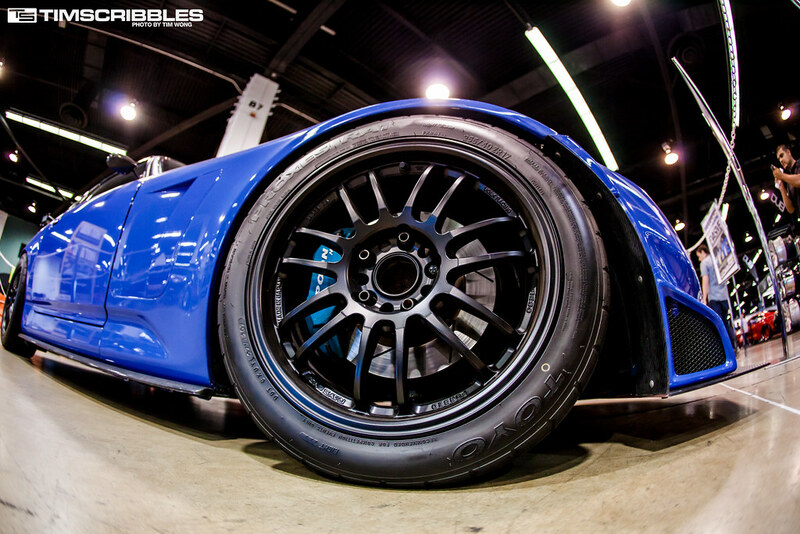 If I didn’t have my fisheye, I doubt I would have been able to grab a decent shot of any of the cars. 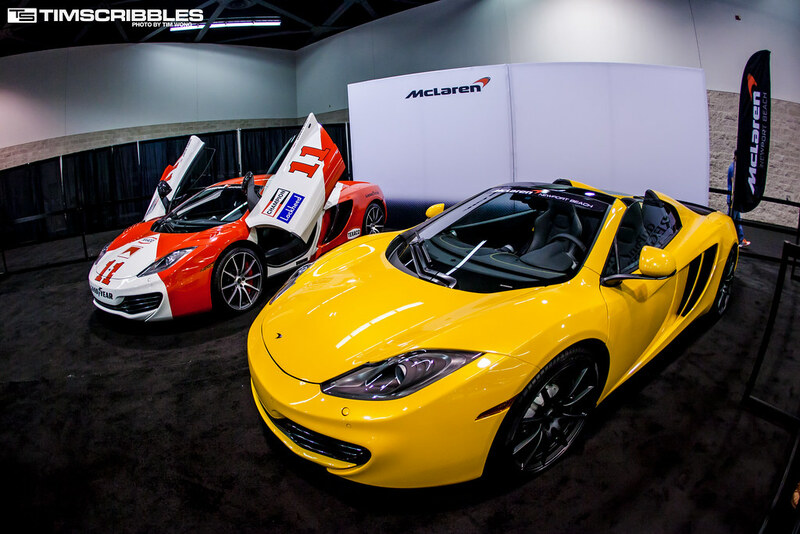 A good amount of my shots were shot blind with my arm hanging over the “lines” and estimating the frame of the shots. 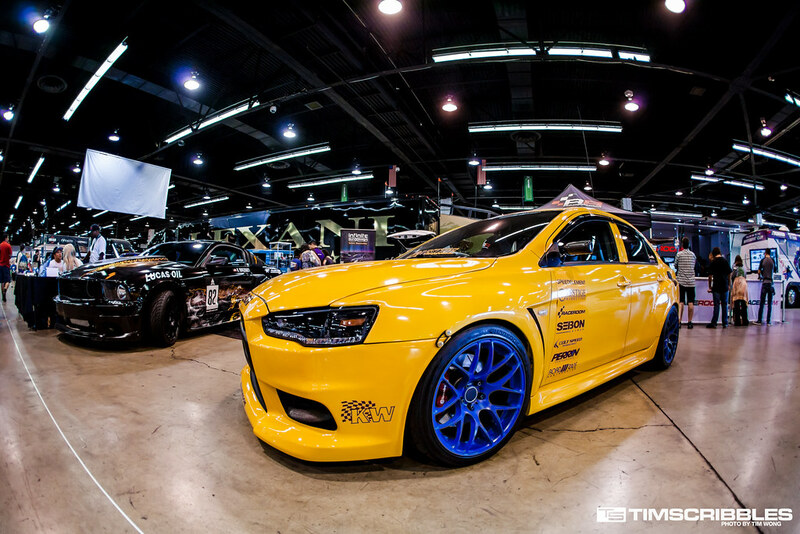 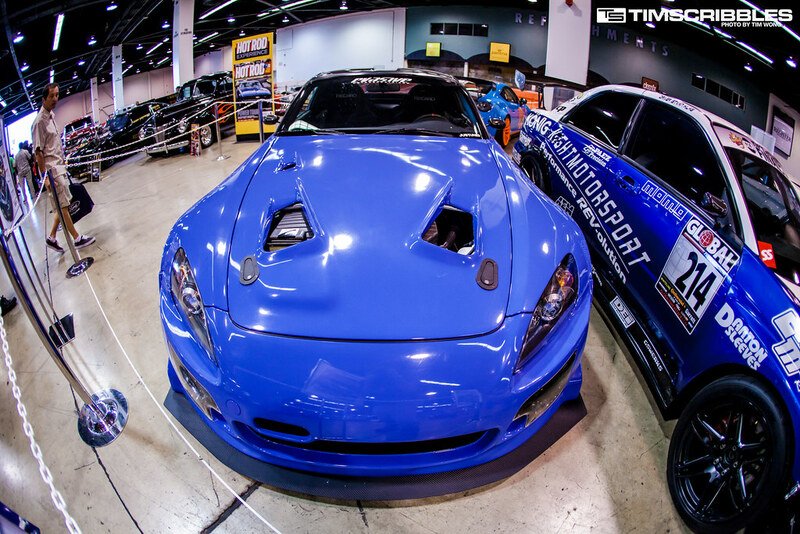 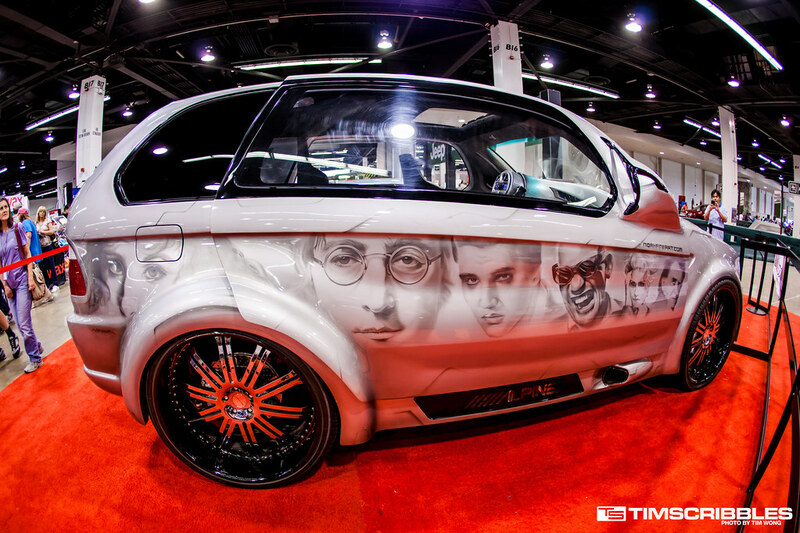 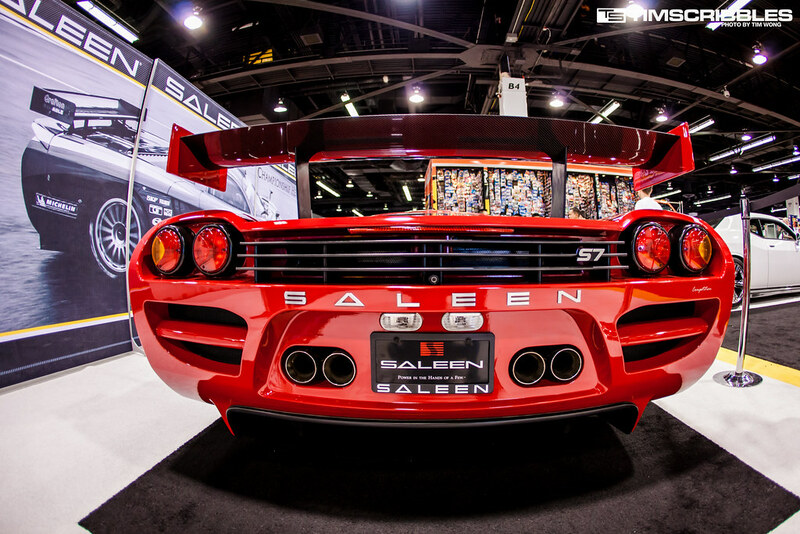 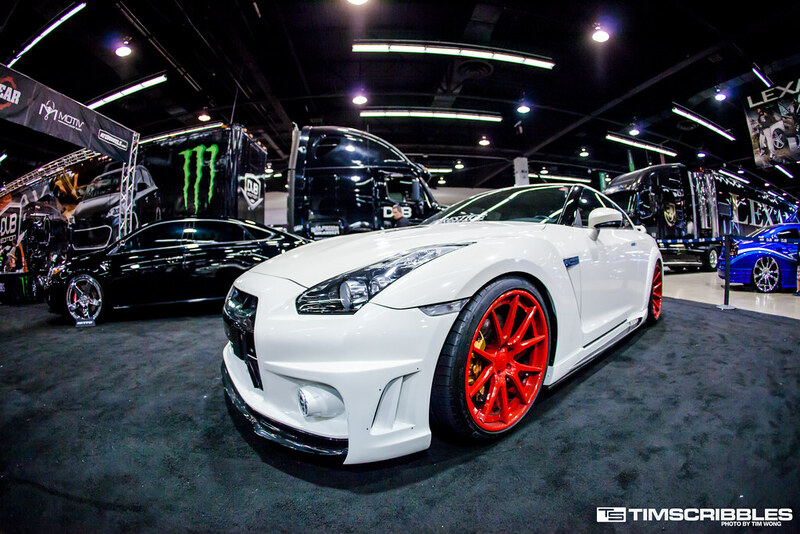 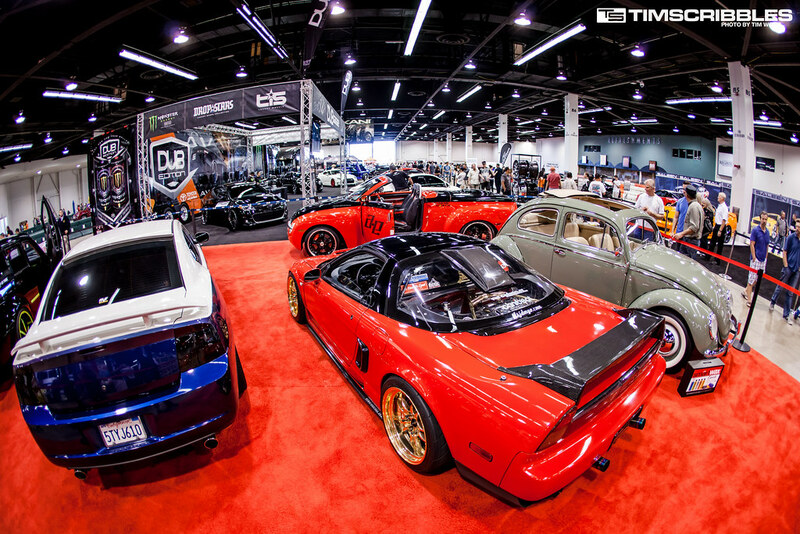 Source Interlink Media had an impressive line up of Japanese car builds like Rywire’s E-AT. 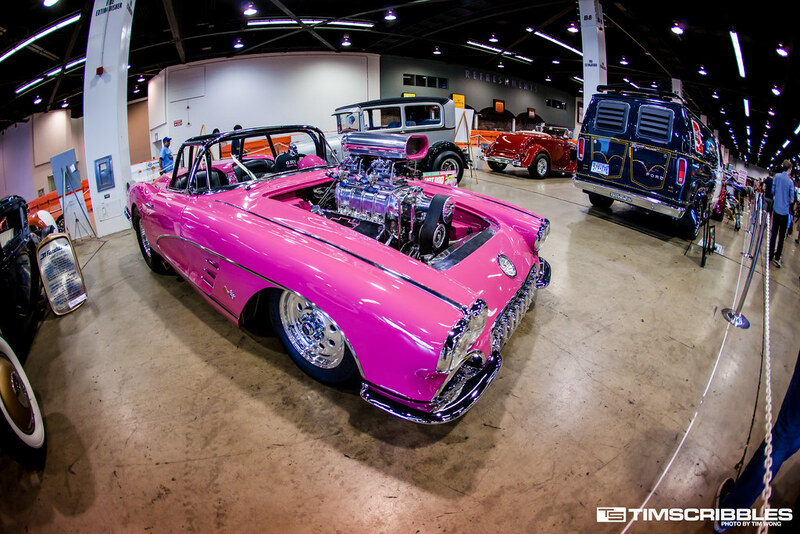 In the manufacturer areas, there were some interesting cars they bought out. 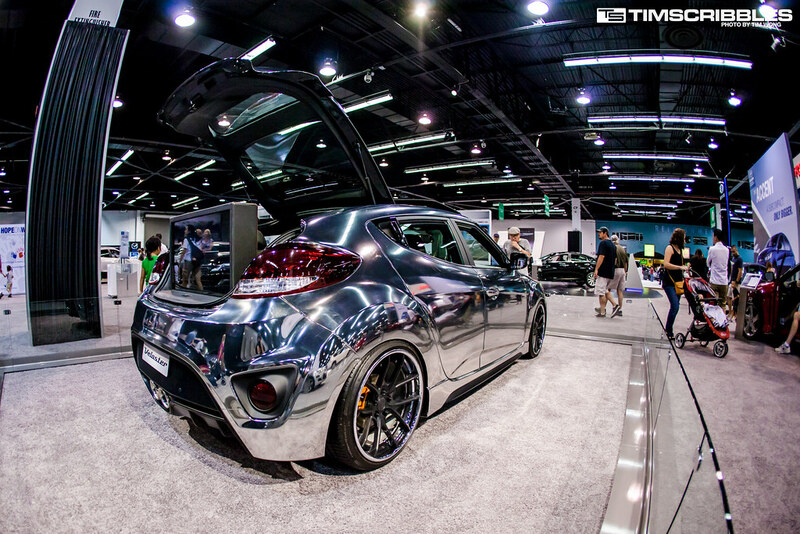 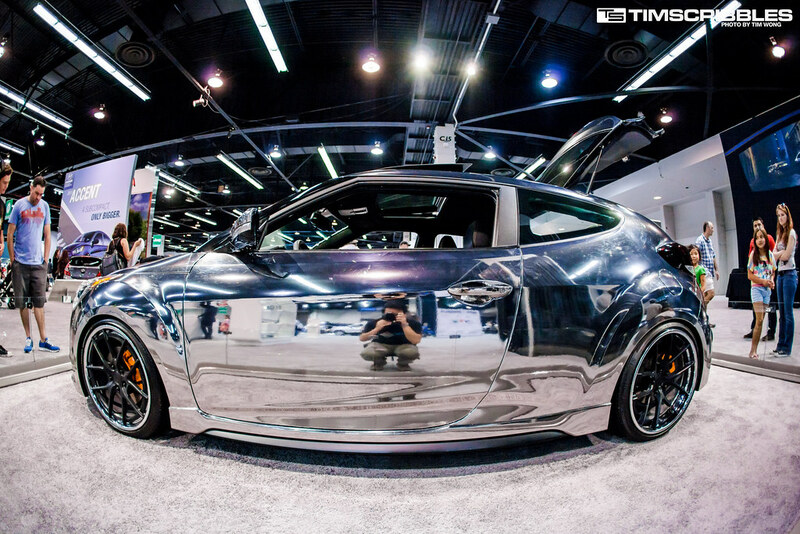 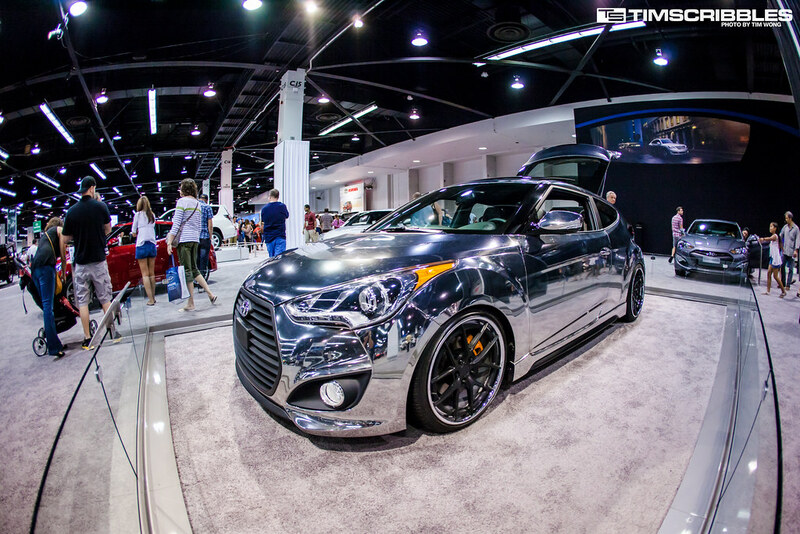 Hyundai had this lightly modified Veloster wrapped in chrome. 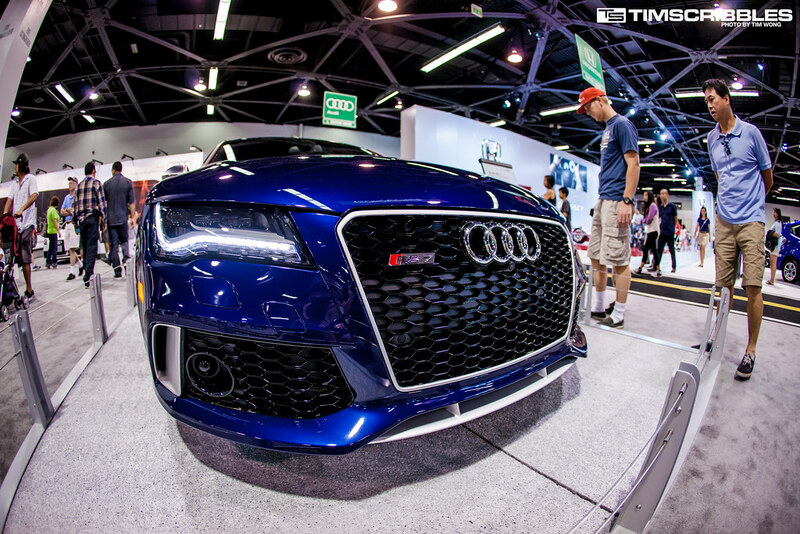 Nice to see Audi releasing a performance version of their large sedan with the RS7. 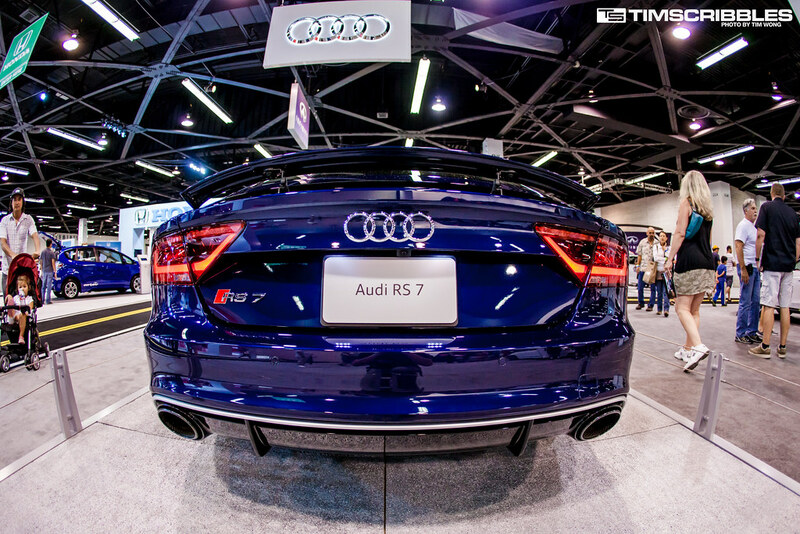 I’ve always been a fan of their RS versions though the RS7 doesn’t look too much different from the regular A7, but the changes are usually in the engine anyways. 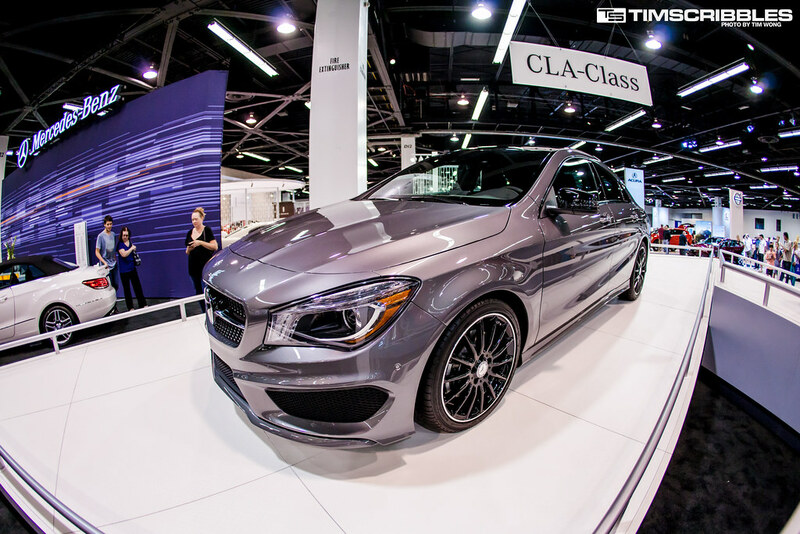 The new Mercedes CLA on the showroom floor is a pretty good looking car all around. 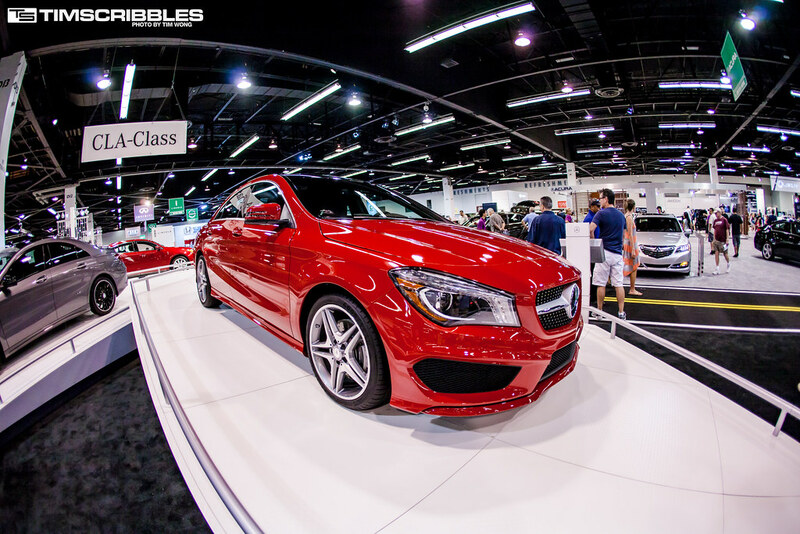 The tail lights have a really nice feel of the CLS, but as a long time fan of the Mercedes line, I really hate to see the “cheapening” of the brand with the smaller engines and bringing in the FWD “poor people” versions of their more impressive line up. 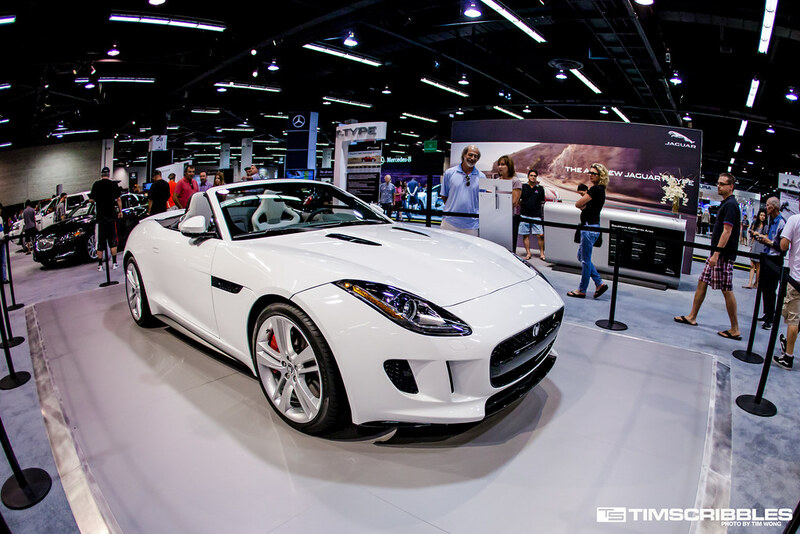 The Jaguar F-Type has been popping up around recently as they are becoming more readily available. 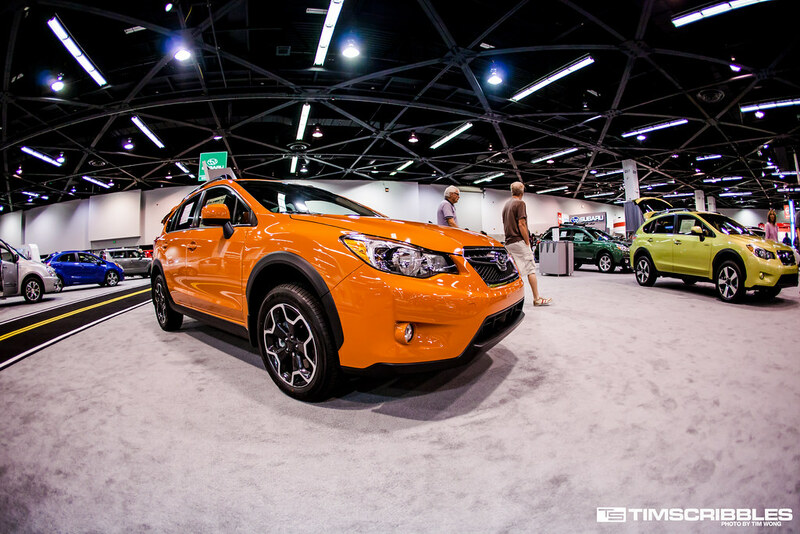 The Subuaru XV Crosstrek is a car that I have found to be underrated as the replacement to the old Impreza Outbacks. 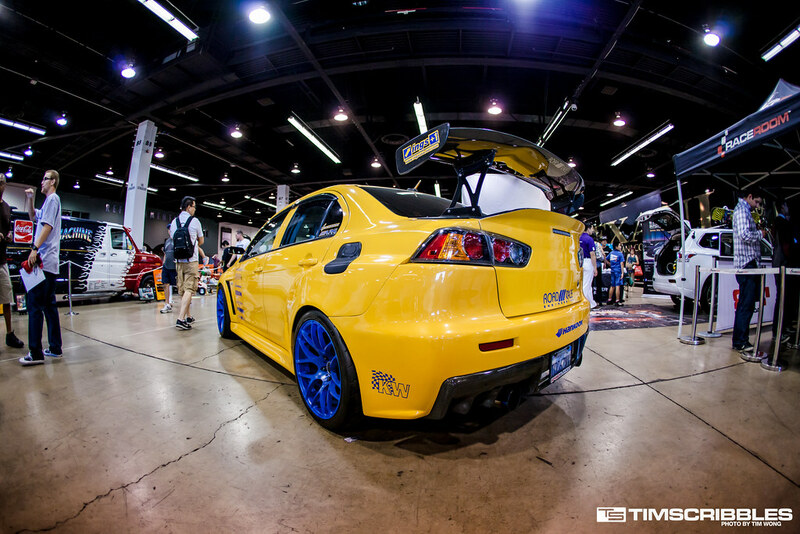 It’s definitely more interesting of a car then the regular Impreza with the lift and the more off-roading look to the car. 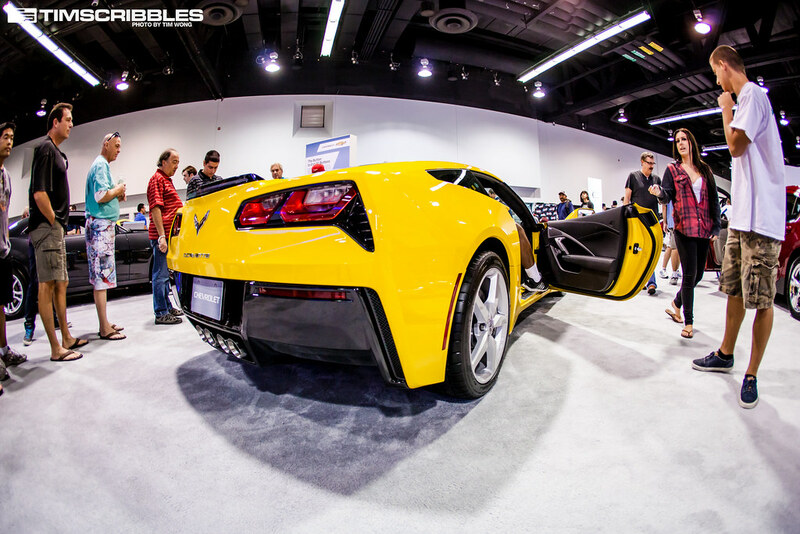 The new Corvette C7 is something I doubt I will ever take a liking to. 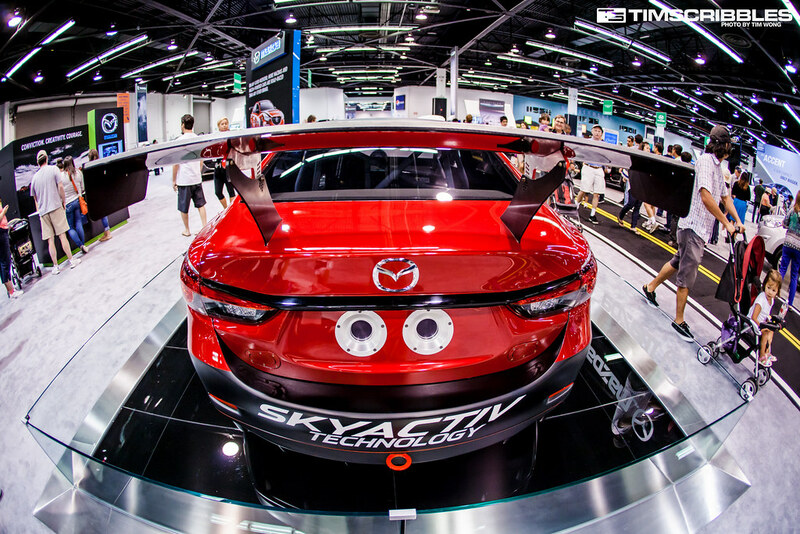 The front end is ok even if it looks like a Viper, but the rear is unbelievably hideous. 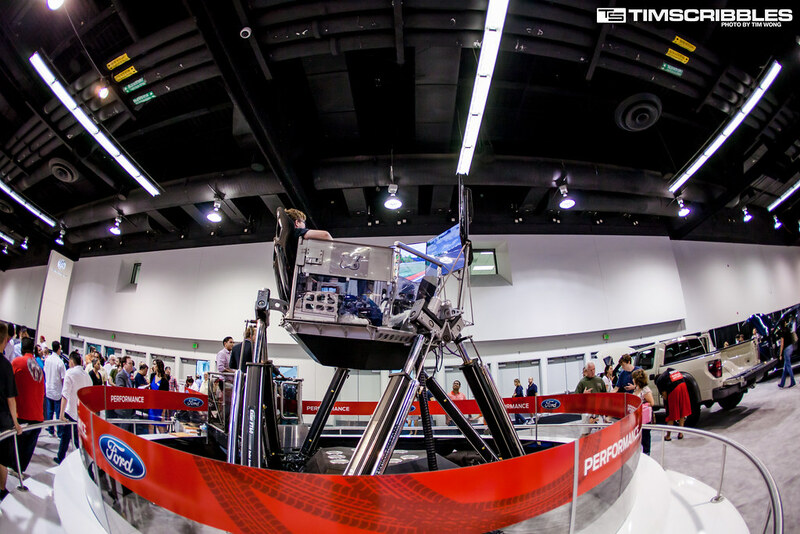 Ford had this complicated racing simulator with people lining up to give it a go. 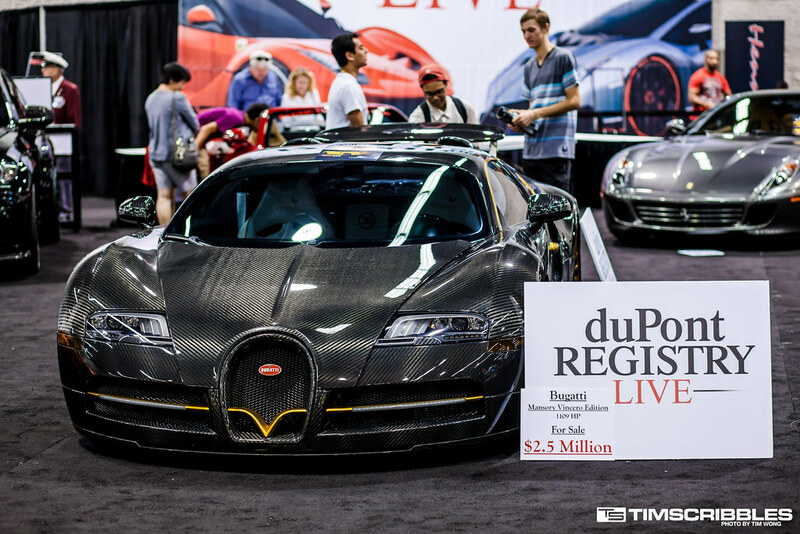 duPont Registry “live” fenced off the area for only “subscribers” to get an upclose look at their cars, but the only thing really all that special was the Mansory Vincero Bugatti Veyron.